If you have a website, it would be very much appreciated if you link to us. Below are some HTML extracts which may be inserted into the <body> part of your HTML code. 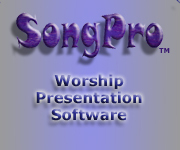 Giving a link to our Website, where an evaluation version of SongPro may be downloaded. Please note: you don't need to copy any images, the code supplied will produce the image.